Scholars are increasingly expected to share their knowledge through different media besides the written publication but struggle to do so. How might they teach their students the skills to do so? This article argues that Practice as Research, developed by practitioners venturing into academia, provides a useful framework for shaping research outcomes into, for instance, video essays or interactive narratives. It is especially valuable for undergraduate students aiming to increase their knowledge and understanding of media through practical work, as it trains them in both practical and academic skills. This gives Practice as Research an added value in academic media studies curricula. 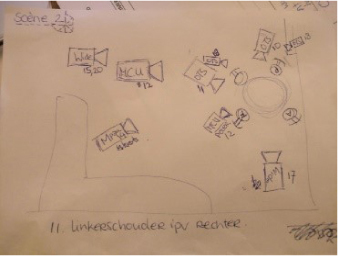 This article is based on a case study of an advanced practical course for film and television students at Utrecht University and relies on course assignments, feedback conversations, and auto-ethnography. As this article was authored by the course lecturer and two students, it provides insight from multiple perspectives. This article is designed as an interactive narrative. Reading it online will provide an enhanced reading experience. The premise underlying the design is the easy access to the different sections of this article. On each page, images link to the various case study findings while the introduction and conclusion are accessible through textual links. In addition, links in the text quickly provide access to related information, including the theoretical framework and case study design. This pdf version annuls such navigation. How might we best teach university students about media? In a continually converging media landscape, media like “television” and “film” become increasingly diffuse and speaking about them increasingly challenging. There seems to be a gap between what is conventionally understood as film and television and how these are still studied and discussed, on the one hand, and how students experience 21st Century media, on the other hand, including games, social media, and other interactive media. In addition, the role of the university in society is changing, and applied science and the humanities are moving closer together. These seem symptoms of a second gap, one between academic generations. We think both gaps need to be bridged. Sarah Barrow, discussing the video essay as a viable alternative to written academic output, argues that ‘it is time to normalise alternative ways to publish and circulate ideas.’1 Thommy Eriksson and Inge Ejbye Sørensen, discussing the video essay as academic output, observe that the ability to write texts is taken for granted in academia. They ask: ‘Is it now time to assume that one should be able to make a video essay?’2 Considering interactive media as a new generation of media and students as the next generation of professionals, we take this question further and ask: Is it now time to assume that media students should be able to make an interactive narrative? For scholars working within the field of digital media, including archives and the Digital Humanities, in general, the answer should be ‘yes.’ But how do we teach them? Creating alternative forms of dissemination, such as a video essay, means moving to the practice of (audiovisual) media making. However, the spoken word is our natural mode of communication and writing a long-established form for disseminating knowledge. According to Eriksson and Sørensen, academics are still overwhelmingly used to and familiar with written research output.3 Although audiovisual output is increasingly accepted in academia, media scholars hardly share their research through audiovisual media.4 This points towards a practice-theory divide: scholars struggle to make the move to turn into media makers. In addition, written research publications yield academic merit; for other modes of expression, this is often still a hurdle. Illustrative of this is a platform such as Scalar. It was ‘designed to make it easy for authors to write long-form, born-digital scholarship online,’ but it was initially used for the interactive presentation of scholarly books and articles.5 It is also visible in the very article you are reading and the platform that supports it. VIEW presents itself as a multimedia journal and explicitly ‘aims at stimulating new narrative forms of online storytelling.’6 At the same time, most articles consist of written texts interspersed with embedded audio and/or video. They are made available as pdf files, as well, so they need essentially to be formatted according to conventional linear written arguments. We, as authors, struggled to conceptualize another form for this article, grounded as our thinking is in the written tradition. The confinements of the VIEW format amplified this struggle. Given these challenges, using alternatives to the written academic argument, i.e., moving to the practice side of media, is not a matter of course. The practice-theory divide has been more successfully bridged by art practitioners interested in researching their practice. Relying on Practice as Research, they seek to generate new and – more importantly – different knowledge through practice.7 Practice as Research has been conceptualized and developed mainly from the perspective of arts practitioners and students and, to a much lesser degree, from the perspective of academics venturing into practice (see, for instance, Borgdorff, and Wilson8). Several academics involved with Practice as Research observe that it is treated with hesitation and scepticism as well as disputed by academia.9 In her recent book, Artists in the University, Wilson states that: ‘It is time to show our colleagues in academia that there are innovative rich-media ways to document, publish, disseminate and evaluate research outcomes.’10 But, while academics, including PhD and MA students, are increasingly encouraged to disseminate their research through non-writing media, BA students are seldom mentioned as target audiences for such practices. We argue that Practice as Research helps to bridge the generational media gap discussed above as it both expands students’ knowledge about media and improves their academic skills. 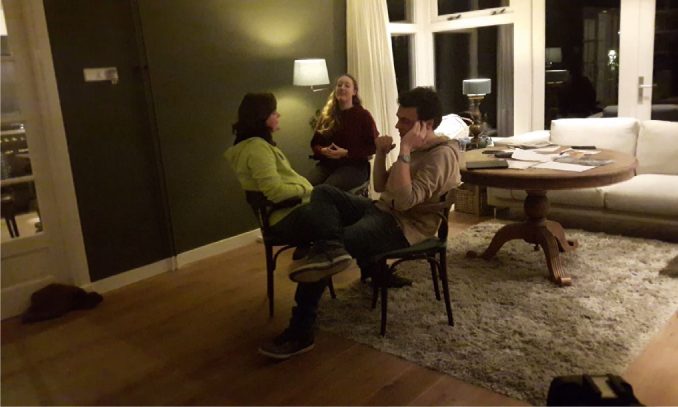 Our argument is founded on our case study of a practical filmmaking course for undergraduate Film and Television Studies students at Utrecht University. 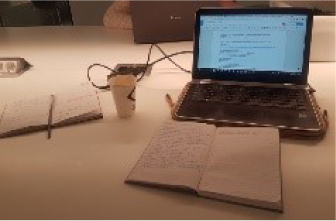 Between November 2017 and February 2018, the lecturer-author was involved in this advanced course as teacher, and the student-authors were involved as students.11 The lecturer decided to have students develop an interactive narrative using a Practice as Research approach. She wished to familiarize them with stories and narratives that were not linear, and increase and diversify their practical skills as well as their conceptual knowledge.12 The interactive narrative had to address, but not necessarily answer, the research question, leaving space for a variety of ways in which to present research ideas and outcomes. To understand the added value of this approach, the lecturer-author decided to investigate how students make sense of media “by doing,” and the student-authors volunteered to participate. Self-Directed Learning and Inquiry-Based Learning served as didactic approaches for the course design. This research takes a Production Studies approach. Through assignments, feedback conversations, and auto-ethnography, students reflected and produced documents and artefacts, which then served as research data. We analysed these data through a thematic analysis,13 then, in tandem with the students, we designed an interactive narrative for this article. The premise underlying the design is the easy access to the different sections of this article. On each page, the images give access to the various findings, while the introduction and conclusion are accessible through textual links. In addition, links in the text quickly provide access to related information. Recent debates point to the complexity of understanding practical knowledge.14 Robin Nelson argues that, apart from “factual” knowledge, there is another kind of knowledge: the knowledge of how to do things. This knowledge is not always transferable through human communication; it is the knowledge gained through doing.15 He defines Practice as Research as ‘a research project in which practice is a key method of inquiry and where, in respect of the arts, a practice ... is submitted as substantial evidence of a research inquiry.’16 In Practice as Research, the practice is both a method to produce knowledge and the outcome of such knowledge. Practice as Research is less established in the Netherlands than in other countries, such as the United Kingdom and Australia. Leiden University collaborates with the Royal Conservatoire and the Royal Academy of Art in The Hague to offer, amongst others, ‘research in and through artistic practice.’22 Leiden University also collaborates with the Willem de Kooning Academy in Rotterdam on the project ‘Bridging art, design and technology through Critical Making.’23 At Utrecht University, researchers from the Media Studies department have only recently begun to develop a collaborative project comparing Practice as Research across disciplines. However, Practice as Research is used in various courses in the department, especially in the context of game studies. Bueger and Gadinger’s term praxiography brings praxis and ethnography together as it refers to practice theory-driven research.24 Ethnography is characterized by a variety of methods for data gathering, including, amongst others, observation, participation, interviews, and diaries. Based on their evaluation of Bourdieu’s “field of practice” and Wenger’s “community of practice,” Bueger and Gadinger discuss four basic techniques for praxiography: observation, learning practices (understood as a form of participant observation), talking about practices, and reading (text analysis).25 These four methods are not unfamiliar to a Production Studies approach, which might include the use of observation, interviews, and production- and industry-related artefacts. The above serves to argue that a Practice as Research approach to our practical course aligns well with a Production Studies approach to researching students’ practices. Assignments served both didactic purposes, including reflection and research purposes, as they produced data. When this produced conflicts of interests, the teacher prioritized didactic purposes. Brookfield sees Self-Directed Learning as an emancipatory learning strategy, despite the highly controlled and regulated society in which it takes place.33 This understanding of Self-Directed Learning aligns well with the intention of this practical course and was, therefore, adopted as a general approach. According to Hobbs, the pedagogy of inquiry should be central to media literacy in order to critically question media texts.34 In today’s media environment however, media literacy involves both the consumption and production of media texts. Inquiry might, therefore, also be central to teaching film making. Inquiry-Based Learning is oriented around the exploration and investigation of a problem, authentic inquiries using contextualized and situated learning, and a research-based approach.35 Relying on earlier work by Hmelo-Silver, Golan Duncan, and Chinn, Blessinger and Carfora argue Inquiry-Based Learning includes gaining epistemic knowledge (knowledge of the subject matter) as well as epistemic practices (knowledge of how to do things).36 Therefore, it seems to align well with a Practice as Research approach. Both Nelson and Bell stress the role of documenting practice to produce what the former refers to as ‘evidence’ in order to make tacit knowledge production explicit.44 To assess the gains of Practice as Research, in Nelson’s view, ‘documentation is integral to articulating and evidencing the research inquiry.’45 He advocates the use of a variety of means to do so.46 According to Bell, a form of auto-ethnography is most suitable.47 This brings us back to Praxiography, Production Studies, and the use of ethnographic methods. Nelson advocates making reading a part of the learning process of Practice as Research from the beginning in order to create resonance between theory and practice.48 Students in the course discussed here were introduced to interactive narratives through literature on interactive documentaries (i-docs). Eriksson and Sørensen mirror academic video with documentary film to claim its validity: both have the intention to disseminate knowledge.49 We would also argue that research underlies both, despite documentary’s association with unmediated reality. This makes documentary a good starting point. Whereas the authors discussed above look at the workings of interactive texts, Lachman focuses on the design of such texts as experiences. Relying on the 5 E’s model of experience design used by Conifer Research, he discusses user-related considerations which are (or should be) involved when developing interactive narratives. The model includes Entice to lead audiences to interactive narratives, Enter to start the interactive experience, Engage for actual interaction with the content, Exit for the way the experience ends, and Extend for users to share or revisit the online interactive experience.54 The 5E’s model was used in the course discussed here to stimulate students to consider its aspects for their own narratives. The course was designed as a Practice as Research project, using Self-Directed Learning and Inquiry-Based Learning as didactic approaches. Documentation of the process of enquiry and production was used to ensure reflection on the process and produce research data on students’ learning. Students collaborated in teams.55 Collaboration was supported through a number of feedback sessions in which students commented on each other’s work. Students were given complete freedom in the choice of subject, research question, and research approach, as long as they translated their research findings into an interactive narrative. Preliminary scaffolding was offered through an introductory lecture during a preceding practical course, a visit to IDFA’s Doc Lab, and a Master Talk by Jonathan Harris. Glass-box scaffolding56 focused on providing knowledge and reflection on existing interactive narratives, specifically interactive documentaries, to familiarize them with some of the questions about interactivity they needed to consider. These questions included the function and goals of interactivity and the different kinds of interactivity.57 A lecture and assigned readings at the very beginning of the practical course were used to furnish this. Some of the readings were also needed for assignments, which refreshed students’ consideration of theory in relation to their practice. Feedback was generated during seminars. Detective Brouwer and the Death in Dreamscape: Help the detective find out who killed Victor van Straaten. 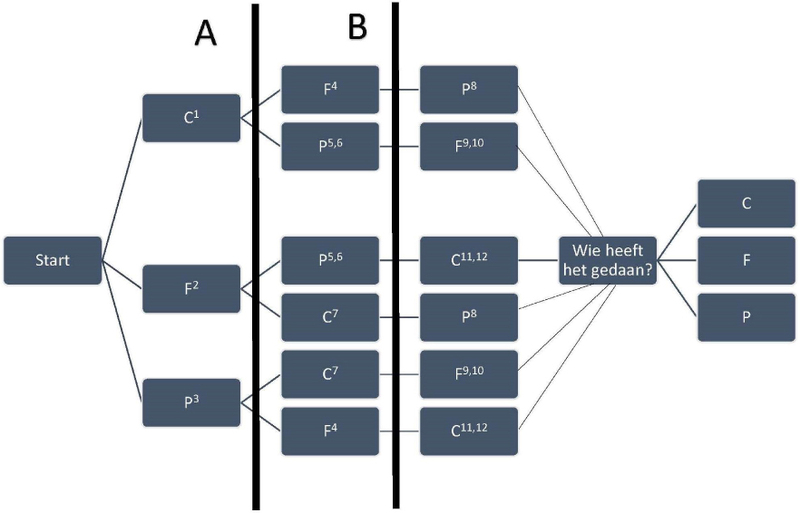 Top of Nederhop: An analysis of Dutch Hip Hop video clips from start to present. During seminars as well as outside of the classroom, and often spontaneously, the teacher and students met to discuss the progress of students’ work, the challenges they faced, and to give feedback where needed and/or desired. For each team, two of these conversations were audio recorded: one on 29 November 2017 and the other on 10 (1 group) and 12 (3 groups) January 2018. As a form of auto-ethnography, the two student-authors, involved with different teams, reflected on their experiences and learning throughout the process. They created testimonies through photos and audio clips detailing their project activities and voicing what they learned. This way, we tried to create a deeper insight into individual learning. To analyse the wide variety of data, we relied on thematic analysis, as described by Braun and Clarke.64 This method is flexible and allows for the inclusion of a variety of data. Considering the research question, the analysis focused on students’ reasoning about their experiences and learning: their arguments for preferring one thing over another, for what does and does not work, and for the choices they made for their own productions. We avoided including merely descriptive remarks. The analysis started with open coding of the data by the lecturer-author. She started with data gathered early in the process. Later on, the two student-authors became involved as well. The coding system used at that moment was shared to give them a kick-start and promote cohesion. The main researcher synthesized the various analyses. The figure above illustrates the initial design of the interactive narrative Detective Brouwer and the Death in Dreamscape. The research question for this project was: How does one build a narrative structure for an interactive detective? The main challenge revolved around the user selecting the order of interrogation of the suspects. The team discussed the need to ‘nail it’ with respect to causality and the need for credibility in the development of the story.66 The initial interactive structure was subsequently completed in Eko Studio (see Figure 2). Figure 2. Final narrative structure of the Detective Brouwer project. Video 1. Video Nederland Fietsland by the Ned Doc Style team, inspired by Bert Haanstra’s work. Go to the online version of this article to watch the video. Audio 1. Reflection by the Ned Doc Style student-author on learning about Honigmann’s style.72 Go to the online version of this article to listen to the audio. The research question for the Nederhop project was: How have the visual aspects of video clips of Nederhop artists developed in the period 1995-2017? Specifically, mise-en-scene (amongst others, props), gender representation, and cinematography seemed relevant. Team members mentioned learning both about the visual style and Dutch hip hop, in general: pioneers, such as Osdorp Posse, and Extince, paved the way for contemporary artists, such as Ronnie Flex and Lil’ Kleine. Figure 3.1. The challenging Detective Brouwer scene: Set-up. Figure 3.2. The challenging Detective Brouwer scene: Rehearsal. Figure 3.3. The challenging Detective Brouwer scene: On set with table. Figure 3.4. The challenging Detective Brouwer scene: Resulting scene. Audio 2. Reflection by the Detective Brouwer student-author on learning perspective.74 Go to the online version of this article to listen to the audio. The Ned Doc Style team, while creating their own work, learned about the role of luck in documentary production: ‘... it’s more a matter of luck… There is a lot of waiting to strike at the right moment to get the desired images,’ commented one.75 In addition, the Ned Doc Style team learned about the complexities of arranging access to archival material and copyrights. The inquiry-based learning approach confronted students with everyday problems that may arise during film production, for which they often found their own solutions, which supports the benefits of self-directed learning. It also confronted them with the epistemic boundaries of media theories, as many issues were context specific. Figure 4. Home page of the Nederhop project (excerpt). Figure 5. 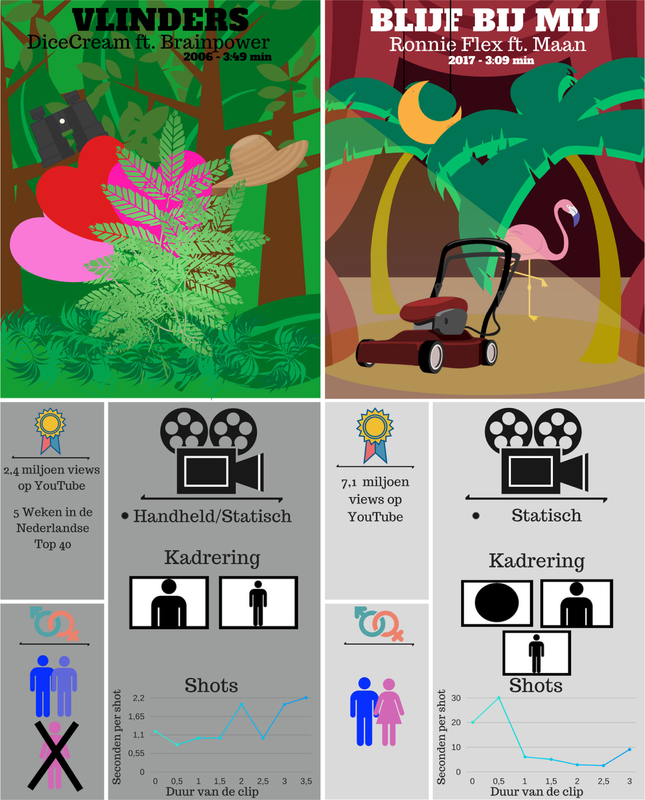 Visualisations of the analysis of two Nederhop video clips, including YouTube views and charts listing, gender representation, camera use, framing, and shot length. Addressing the user directly or requesting her to respond to a question worked in terms of students becoming engaged in a project. The freedom to ‘choose your own adventure,’ providing agency over the narrative, was the founding principle of the Detective Brouwer project.82 The EDMOP project followed a similar logic. Team members were primarily interested in investigating the consequences of user choices and reciprocity: ‘When interactivity does not influence the experience of the user, in my opinion, there is no added value to the product,’ said one.83 In their own project, the user is drawn into the narrative, as it progresses through her choices as an intern, making decisions and being presented with the results. For instance, users choose between scenes shot in long shots or close-ups (see Figure 7). Figure 6. Home page (left) and still from the opening sequence (right) of the Detective Brouwer project. Figure 7. Scene from the EDMOP project. Different versions of the short film Keel (Throat) based on the user’s choice of long shots (left) versus close-ups (right). Through their engagement with existing interactive narratives, resulting in epistemic knowledge, students learned to consider the relationship between design, interactivity, and user involvement and used this in the development of their own projects, resulting in epistemic practice. Audio 3. Reflection by Ned Doc Style student-author on learning from working with limitations.86 Go to the online version of this article to listen to the audio. As the above audio clip from one of the student-authors illustrates, the black-box scaffolding that dictated the time limit for the project encouraged the Ned Doc Style team to come up with a project that was both informative and manageable. Thus, the team decided to limit their project to three Dutch filmmakers. They also limited the number of films from each oeuvre, asking themselves: ‘What can we achieve in this short period of time?’87 As the audio fragment illustrates, this meant sometimes ‘cutting the knot’ in order to proceed and keeping the analysis feasible, but also adapting the design according to the technology and knowledge thereof available. A similar efficiency also marked the work of the Nederhop team. They aligned the number of video clips to analyse with the course’s workload. Also, they chose existing technology, Word Press and Canva, to match their needs because they were free and easy to use.91 As a consequence of choosing these technologies, there were limited options with which to moderate and adapt the web pages. The team learned to work their way around this and still achieve navigation suitable to their original idea. The above shows how black-box scaffolding encouraged continuous consideration of the limited length of the course and resources available for the project. At the same time, it illustrates how students in self-directed learning projects find their own solutions. The Detective Brouwer team chose to ignore partly the given time restraints. From the start, they struggled to align their plans and ambitions with the resources available. A number of setbacks caused delays to an already ambitious plan.92 However, their enthusiasm made them reluctant to take short cuts to save time if they felt this would jeopardize the quality of their project. As a result, their project was finished only about a month after the original deadline. Audio 4. Reflection by the Ned Doc Style student-author on the importance of planning. Go to the online version of this article to listen to the audio. Figure 8. Planning work at EYE study collection centre in Amsterdam for Ned Doc Style. Audio 5. Reflection by the Ned Doc Style student-author on the importance of open communication.97 Go to the online version of this article to listen to the audio. As the above shows, through the collaborative production of film and research, students learned how important it is to address communication problems and be on the same page. They practiced their organisational skills, as well, which was part of their epistemic practice. Audio 6. Reflection by the Ned Doc Style student-author on developing a research question.99 Go to the online version of this article to listen to the audio. In the audio clip above, one of the student-authors reflected on how to deal with research questions. She and her Ned Doc Style partner focused on watching a number of documentaries and formulating a research question before starting their analysis. In their enthusiasm, the EDMOP team worked the other way around and jumped right into the making process. Peer feedback told them that they were well on their way to finding literature, but the team found they postponed studying it. They concluded that if they had started reading literature earlier on, then they would have been able to work more accurately, and elaborate the research question and visualize the elements they chose to focus on better. A number of students practiced their analytical skills. One student mentioned that ‘Thanks to this project, I can now execute a semiotic analysis. Now I will be able to critically analyse visual content.’106 As this method was the team’s choice, self-directed learning brought her to this point. Through their Practice as Research projects, students developed a number of academic skills, including developing a research question, the use of theory, and the analysis and dissemination of academic knowledge. This makes Practice as Research useful specifically for academic students. In the practical film-making course discussed in this article, students followed a Practice-as-Research approach to investigate a media-studies-related research question and present their findings in an interactive narrative. Relying on self-directed learning and inquiry-based learning approaches, students received scaffolding in the form of a lecture, a tour of IDFA’s DocLab, and a Master Talk by Jonathan Harris, as well as assignments and feedback conversations. The latter two and auto-ethnography by two students served as data for this article’s case study, following a Production Studies research approach. The Practice as Research course yielded both what Blessinger and Carfora refer to as epistemic knowledge and epistemic practice; it resulted in learning about content and in learning media practice.107 In terms of content, the students learned about narrative techniques related to suspense films, the visual design of Dutch hip hop videos, different documentary film styles, and the forms and functions of interactivity. In terms of practice, they learned about the everyday challenges in filmmaking, be it fiction (including challenging scenes) or documentary (waiting for the right shot). Many of these challenges are too specific to teach on a theoretical level, and they show the epistemic boundaries of theory and the added value of Practice as Research. Based on their evaluation of a number of interactive narratives, students learned to consider how to speak to users to seduce them into their own narratives, both in terms of interactivity and interface design, while also managing users’ expectations. In addition, they learned what it means to work with limited resources and around some of these limitations (or ignore them).They also gained experience in organisation and teamwork. Here, their practical knowledge was expanded. However, students also expanded their academic skills, including analytical skills. Most notably, they explicitly aimed to teach audiences, thereby developing dissemination skills. While Nelson’s definition of Practice as Research focuses on practice as method and outcome,108 our results suggest that Practice as Research also supports the development of academic skills. This makes Practice as Research an added value for media students wishing to gain practical experience in relation to theory. In this course, the self-directed and inquiry-based learning strategies worked well. Outside of the confines of rather strict academic guidelines, students are not afraid to develop ambitious projects and come up with creative solutions and expressions. The glass box scaffolding109 seemed to have worked well to introduce students to new narrative forms. The amount of black box scaffolding110 could be increased by introducing the various tools and platforms to students in the form of an intensive workshop rather than in the brief tutorial given this time. For the student-authors, being involved in this project meant being in the twofold position of both reflecting upon the course from the inside – doing their Practice as Research projects - and the outside – studying Practice as Research projects – which added a dimension to acquiring knowledge. As they had to write their own reflections at the end of the course as well as analyse reflections from other students, they obtained a better understanding of what they had actually learned but also of why a Practice as Research approach is useful for students. Being given the opportunity to co-author an article gave them an insight into the writing process for an academic journal. This also reflects a Practice as Research approach as they learn from doing the co-authoring. They learned, for instance, to consider carefully the reviewers’ feedback while making sure that any changes would not distract from the main points of the article. Thus, a valuable lesson was learned in how to maintain one’s own integrity as an academic and stay true to one’s ideas, while also being open to other people’s ideas. It was also valuable for the teacher to obtain this inside look from students. Discussing the data and results gave all of the authors a greater and more complete understanding. Developing an interactive narrative to communicate this research proved a challenge and illustrates the difficulty of bridging the theory-practice gap. The authors struggled to design a narrative that would serve both the online and the offline reader. Facilitating interactive navigation also means that the different elements of the argument needed to be connected through links rather than text. This entailed a move from ‘telling’ to ‘showing’ connections. For this article, the authors explored the possibilities of the VIEW platform. They invite other researchers to continue this exploration. More research into the added value of Practice as Research for BA students is needed, of course, but the results presented here suggest that Practice as Research can help overcome both the epistemic boundaries of theory and bridge the theory-practice gap for BA media students, in order to teach them new knowledge, forms of dissemination, and practices to prepare them for the job market. Many thanks to the eighteen students who participated in the practical course 2017-2018 for sharing their experiences and work and allowing us to use these for this article. Thanks also to two anonymous reviewers for their constructive feedback. Willemien Sanders holds a PhD in Media Studies and is a lecturer in the Department of Media and Culture Studies, Utrecht University. Her research interests include, but are not limited to, documentary film and non-fiction film and television production. For EUscreenXL (2013-2016), she was involved in developing tools for contextualizing audio-visual content and publishing online with audio-visual material. She is currently investigating documentary impact production. She is a co-chair of the Media Production Analysis working group of IAMCR. In addition, she is a freelance critic for the Modern Times Review. Daniel Everts is currently a third year Bachelor of Arts student in Communication and Information Studies at Utrecht University, where he is also enrolled in the Humanities Honours Programme. His main focus is on contemporary media developments in the fields of film and television. He is currently writing his BA thesis on environmental discourse in contemporary Dutch documentaries. His paper on localization practices in the contemporary television industry is due to be published in the student-run magazine for audio-visual culture, BLIK, come summer of 2018. Daniel has been involved in the creation of multiple documentaries (academic and otherwise) in the roles of director, D.O.P, editor, researcher, interviewer, and music composer. Bonnie van Vugt is a third year Liberal Arts & Sciences student at Utrecht University. She focusses mainly on philosophy, film, media, and culture. She is currently writing her interdisciplinary thesis on how to criticize films as an art form, in collaboration with students from Film Studies and Artificial Intelligence. She is also enrolled in the Humanities Honours programme, in which she uses (documentary) film to present her philosophical / socially critical research. She recently started volunteering at the EYE study collection centre. The course included the following assignments. Are you happy? ; Bear 71; The Big Issue: A Web Documentary on the Obesity Epidemic; Bistro in Vitro; Do Not Track; Filming Revolution; Fort McMoney; A Game of Shark and Minnow; Gaza/Sderot; Hidden Wounds; Highrise; Hollow; Immigrant Nation; Journey to the End of Coal; Pine Point; Prison Valley; Refugee Republic; Solar System; Universe Within; The Whale Hunt. In the third week of the course, students presented their research interests/ questions, their anticipated sources, and the basic arrangement of their narrative, including arguments for their choices. They received peer feedback on their ideas. In addition, a pitch before an industry professional was scheduled but, unfortunately, this had to be cancelled. In order to discuss and reflect on the question of how to assess the quality of the practical course results, students formulated five criteria for assessment, founded on arguments using two of the course readings and referring to two projects they had discussed in Assignment 1. This was meant to promote their reflections on their own work based on their earlier reflections and experiences. Part of students’ final assignment consisted of a report in which they reflect on what they have learned. More specifically, they were asked to discuss and account for the choices they have made with respect to their interactive narrative. They were also asked to reflect on their own functioning by addressing questions about what issues they encountered and how they dealt with them, what they learned about their studies in relation to practice, and themselves as practitioners.